Life continually finds a way to remind me that all someone has to do is slap a Jurassic Park logo on something and I’ll buy it. Since Mattel got hold of the Jurassic World toy license money has been leaving me faster than a gas powered Jeep fleeing a T-Rex. 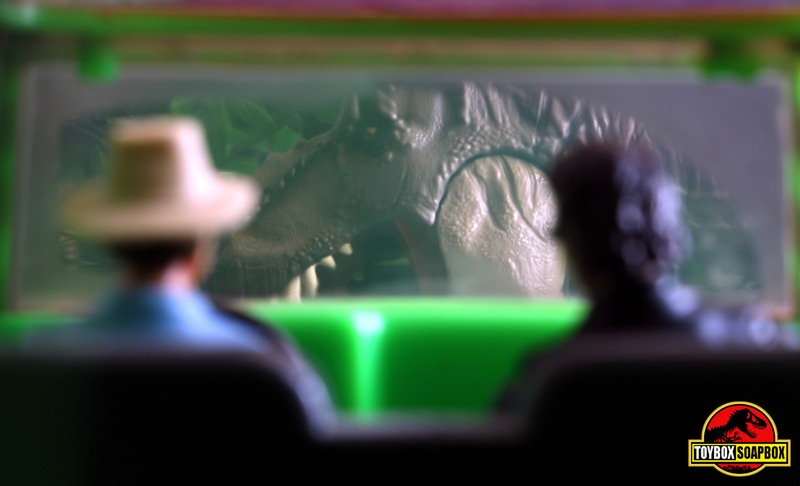 Yet for all the love I have for the Jurassic Park, and Jurassic World toys from both Kenner and Mattel, there has always been one glaring gap – screen accurate toys of the dinosaurs from the first movie. Considering how iconic the animals in the original movie quickly became it’s always struck me as odd that there isn’t aren’t the slavishly accurate toys to match. 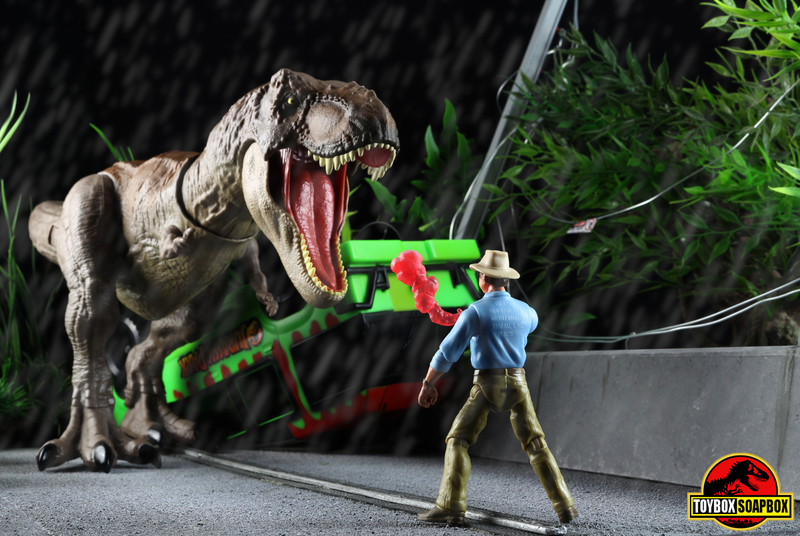 With the original Tyrannosaurs return in the Jurassic World movies, I figured a movie deco had to be nailed on but Mattel have mostly favoured a more saturated colour palette. 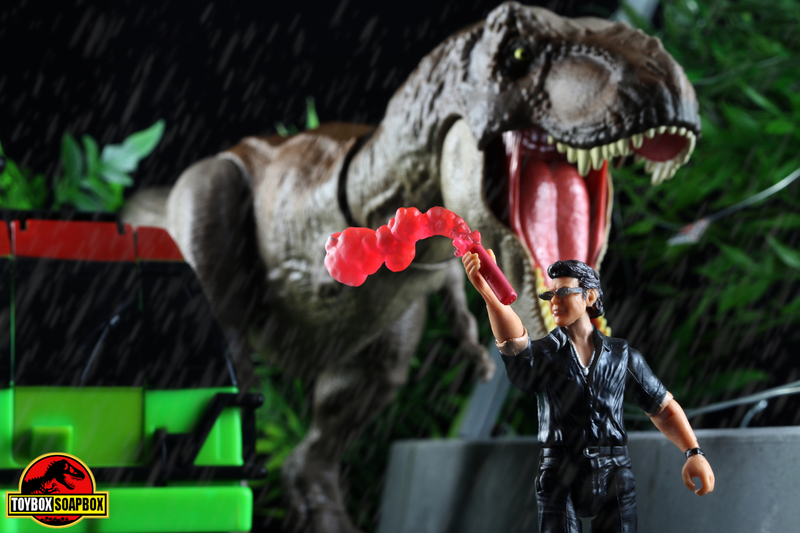 That is until now, with the arrival of the amusingly 90’s like named “Bite’N’Fight” Tyrannosaurus Rex figure. Welcome to….errr…well just read on. 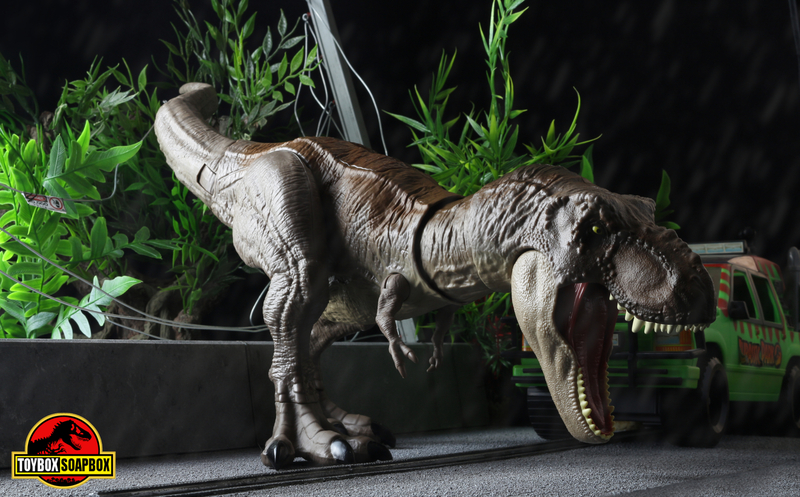 The most appealing selling point of the “Bite N Fight” Tyrannosaurus Rex is it’s more screen accurate colouration. For 25 years fussy sods like me have wished for a Rex who looked like the one that stomped her way into our imaginations by mangling a Ford Explorer in the same way I mangle a packet of Monster Munch. In 1993, Kenner’s “Red Rex” may have been the toy I most wanted ever in the universe ever that week (and didn’t get until recently, alas still missing an arm *cries*), but it didn’t greatly resemble the Rex from the movie. The paint deco on this toy is so much closer than any other toy that has come before it, and the sculpt wears it like it’s going out for a night on the town in fanciest outfit. In a manner unlike her previous toys this feels like Rexy rather than just a T-Rex. 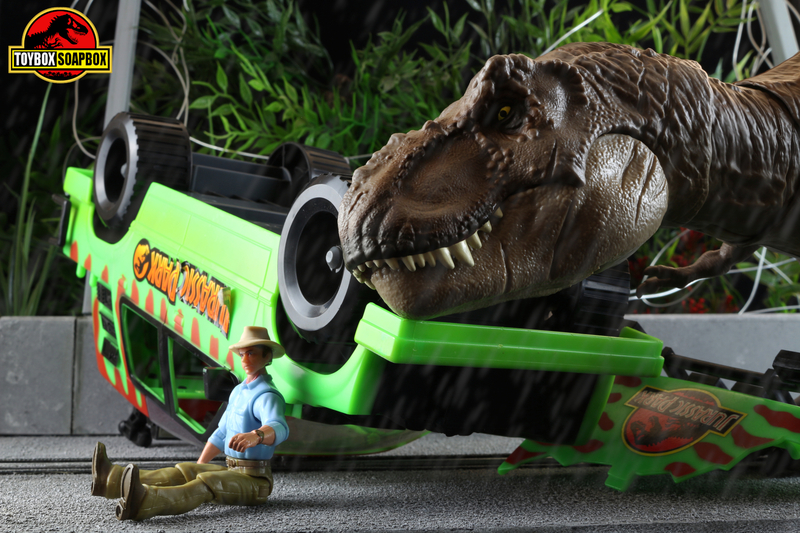 Mattel could have just recoloured any of their previous Rexy toys at this scale and called it a day, but thankfully they aren’t a bunch of Dodgsons. We get a mostly new mold with features different to any of the Mattel T-Rex’s that came before it. Some of the parts (namely the head and legs) do look like they are reused from the “Thrash’N’Throw” Tyrannosaurus Rex who appeared earlier in Mattel’s Jurassic World toy line, but the bulk of the figure seems to be new so perhaps Mattel wanted to spare slightly less expense. A gorgeous paint scheme works wonders in picking out the detailing etched onto the toy as well as differentiating it from the previous toys which went for a more saturated colour scheme. Darker tones across the body do a great job of making the body feel lived in, whilst the paint on and around the eyes does a great job of conveying the sense of menace we all felt when we saw her glare through the Explorer’s window. Two buttons are sculpted into Rexy’s back and are designed to blend in with the body. Often, action features come with the caveat of large, obvious buttons that stick out and shatter any illusion. Mattel have been pretty good at blending these into the sculpts rather than having them sticking out like a sore thumb….or claw. Rexy’s neck does give away her twisting neck feature, but it doesn’t really detract from the beauty of the sculpt. She’s old, we all get wrinkles. Additionally, as her neck spins her mouth also bites and clamps shut. It’s a fun play feature and we just need a Donald Gennaro with “tear and share” action…. Rexy’s second feature, activated by pressing the other button, is a swishing tail. The tail is now hinged in two places so it swings a bit like those plastic toy snakes we all reused as Ninja Turtle nunchucks as kids. Putting my collector hat on for a moment, ideally I’d probably prefer a hyper articulated figure and the option of choosing whether to display it with the mouth opened and closed, but then it’s a toy and it’s greatest strengths are how it infuses something so nostalgic with a play value that will appeal to modern kids as they take it on many new adventures. Plus the bonus of having fewer joints is the sculpt remains unbroken. Still, Mattel could at least have taken the opportunity to finally give their dinosaurs knees, but alas the only leg articulation still only extends to the hip. An extremely tight ratchet that requires a bewildering amount of force to move holds that leg in place, with each ratcheting point is spaced so far apart out that finer, subtler poses are pretty much out the window. 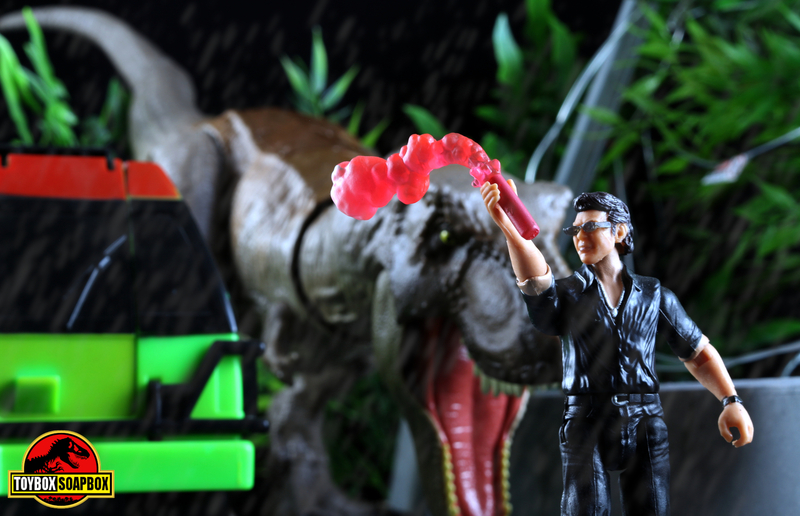 Last years fantastic Indoraptor figure demonstrated that Mattel know how to work articulation into a dinosaur toy, so it’s curious as to why they’ve not applied it to any other figures. Maybe they were aiming to keep their toys to as durable as possible and they’ve succeeded because their dinos are all like prehistoric Tonka toys on legs, but it’s a shame that these amazing sculpts don’t all get the dynamic articulation to do them justice. Speaking of articulation, I believe Rexys’ tiny little slappy hands are new as there are visible hinges on each shoulder that I can’t spot on the Legacy or Thrash and Throw figures. So she can flap her arms like a bird and moan about feathers, should you be one of those types. Her tail, neck and mouth also move but that requires pressing the aforementioned buttons to activate. 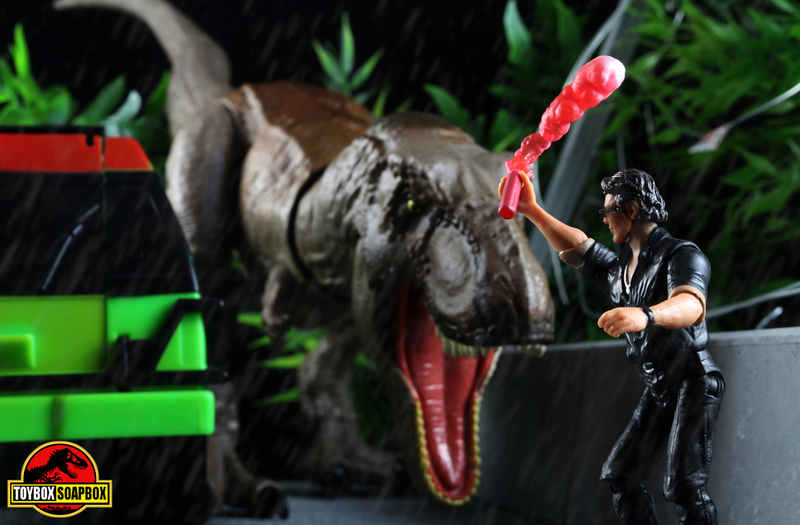 Rexy’s head can swivel independently but only side to side as her scarred neck is locked into the “Bite” portion of the “Bite’N’ Fight” name. So it can be a battle to get it posed how you want to and often it requires strategic use of paper jammed into the button slots. All three smaller Rexy figures (I don’t own the Super Colossal figure because I’ve yet to win the lottery) are very similar, but their head articulation works completely differently because they are all tied into their respective special features. 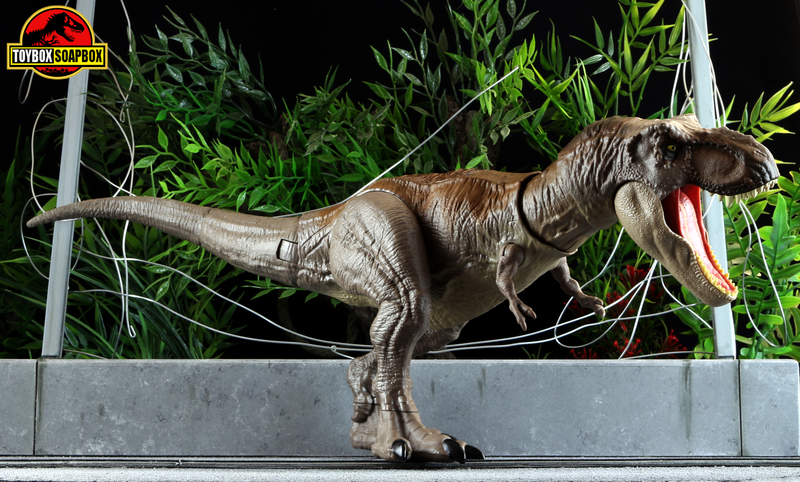 Hopefully when the collector focused line that was shown off at SDCC last year is finally released, it at some point makes room for a fully articulated, ultra detailed Tyrannosaurus Rex with all of the bells and whistles the collector market could. But in the meantime the regular toy line is already a great job of not only connecting us to our childhood via character selection and paint deco, but also by working in some fun special features that make me not want to put them down. However, I would really, really, really, like to see more of the original animal colour schemes, mainly so I can finally get some Raptors who look like they’ve just eaten Ray Arnold. Scratching a 26 year itch is always going to be rewarding and finally having the Rexy I wanted as a kid feels like an oddly surreal, not really important life goal has been ticked off the list.